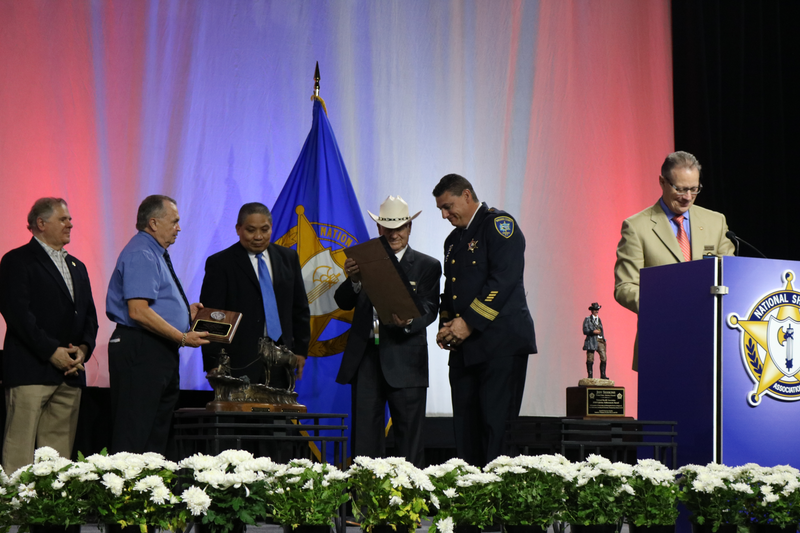 The award is designed to recognize law enforcement officers and others who have made significant contributions to, or outstanding achievements in, highway safety over the course of their career. "I was proud to accept the J Stannard Baker Award on behalf of the men and women of the Niagara County (NY) Sheriff’s Office who work so hard to prevent traffic deaths. Traffic enforcement is the cornerstone to creating safe neighborhoods. It is well documented that well-planned traffic enforcement not only saves lives but has a resounded positive effect on lowering crime rates. I challenge every law enforcement leader reading this article to make traffic safety a top priority within their agency. I’m honored to join the other great recipients of the J Stannard Baker Award for Traffic Safety." The deadline for submitting to the 2018 J. Stannard Baker Award for Highway Safety is May 1, 2019. To submit your application, click here. If you have submitted in the past, please consider submitting again! Sponsored by NHTSA, and Northwestern University Center for Public Safety. Sponsored by the National Sheriffs' Association, the National Highway Traffic Safety Administration, the Northwestern University Center for Public Safety, and OnStar, the prestigious J. Stannard Baker Award for Highway Safety recognizes individual law enforcement officers and others who have made significant lifetime achievements in highway safety. The award is designed to recognize law enforcement officers and others who have made significant contributions to, or outstanding achievements in, highway safety over the course of their career. The National Sheriffs' Association is dedicated to promoting exemplary performance and creative approaches to enforcing traffic safety within the office of sheriff and those who support their efforts. Through partnerships with the National Highway Traffic Safety Administration, and Northwestern University Center for Public Safety, and OnStar, NSA works to recognize excellence in local community programs and national attention through the J. Stannard Baker Award. Northwestern University Center for Public Safety is proud to sponsor the J. Stannard Baker Award. J. Stannard Baker, while working with the Northwestern University Center for Public Safety (formally the Traffic Institute) developed a mathematical and physics approach to crash investigation that has been replicated worldwide. J. Stannard Baker was well known as a pioneer in the broad field of traffic safety. The lives saved through one man’s brilliant initiative is immeasurable. The Center for Public Safety continues in this tradition of "Advancing Excellence". The advancements of the Traffic Institute and J. Stannard Baker live on in the spirit of law enforcement officers working to advance the field of crash investigation and traffic safety. Development of Unique Law Enforcement/Community Traffic Safety Programs: This is to recognize an employee (officer, deputy sheriff) from an Office of the Sheriff who has shown unusual initiative and imagination in developing and promulgating traffic safety programs over the span of a career. A heroic or meritorious service act involving a traffic safety function is acceptable in this category. Special Award to Governmental or Private Individuals: The award panel may grant a special award to a person who has made an outstanding contribution to highway safety over the course of a career. The award is managed by the National Sheriffs' Association. The selection panel is made up of NSA's Traffic Safety Committee which may or may not grant awards, at its discretion, or present special awards, as merited. The award recipient will be notified by June 1 each year, and will be invited to attend the NSA Annual Conference where the award is conferred. Travel and lodging expenses are provided for the recipient. Candidates for the award must be a full-time paid officer or deputy sheriff from a city/county office of sheriff with a career dedicated to traffic safety. The employee or civilian being nominated must have contributed to the highway safety program in their governmental agency over the course of a career. Long years of service alone are a consideration but not a determining factor. Equally, short service may be considered. However, the quality of the service or program is the essential factor. To receive this award, the individual must first be nominated by a law enforcement agency, traffic safety group or official; and second, must be a full-time paid employee of a city/county office of sheriff or provide outstanding traffic safety contributions benefitting the office of sheriff. An individual from either the public or the private sector who has made a significant contribution to highway safety would also be eligible for the special award. This award is designed to recognize the individual efforts of government employees, such as traffic engineers, educators, judges, prosecutors, motor vehicle examiners, etc., who have made outstanding contributions to highway safety programs and issues that benefit law enforcement and the office of sheriff. For more information, contact Mike Sabol at 703-838-5353.
Who Was J. Stannard Baker? This lifetime achievement award is named to honor J. Stannard Baker, a former physics professor at Northwestern University who made significant contributions to highway safety. A pioneer in crash reconstruction investigation, he developed this subject into a science by applying the laws of physics and developing mathematical equations to assist law enforcement officers in their investigations. The first books on crash reconstruction investigation were written by J. Stannard Baker and are still in use today.